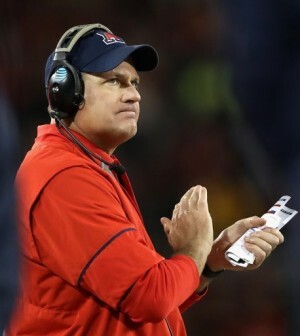 Arizona university have fired their football head coach Rich Rodriguez after six seasons with the program. The news comes days after sexual harassment allegations against the 54-year old were made public stemming from an investigation into the school’s questionable workplace environment that began in October. The accusations against Rodriguez were reportedly made by his former administrative assistant. Rodriguez posted a combined 43-35 record during his tenure with the Wildcats. He recently admitted to having an extramarital affair, but vehemently denies the allegations placed against him. “The University initiated a thorough outside investigation. I fully cooperated with the investigation, including voluntarily taking and passing a polygraph.The University determined that there was no truth to her accusations and found me innocent of any wrongdoing.” said Rodriguez.